Starring Kate Winslet, Justin Timberlake, Juno Temple, Jim Belushi, Max Casella, Geneva Carr, Tony Sirico, Steve Schirripa, David Krumholtz, Jack Gore, Robert C. Kirk, Tommy Nohilly, John Doumanian, Thomas Guiry, Gregory Dann, Bobby Slayton, Michael Zegarski, Brittini Schreiber, Debi Mazar and Maddie Corman. Distributed by Amazon Studios. 101 minutes. Rated PG-13. At one point in Woody Allen’s new nostalgic look back at life in Coney Island in the 1950s, one of the characters gives another character a birthday gift – a book of the complete plays of Eugene O’Neill. That is interesting, because it appears that Allen is trying to make his own version of an O’Neill play here: perhaps Desire Under the Midway, or The Ice Cream Man Cometh. 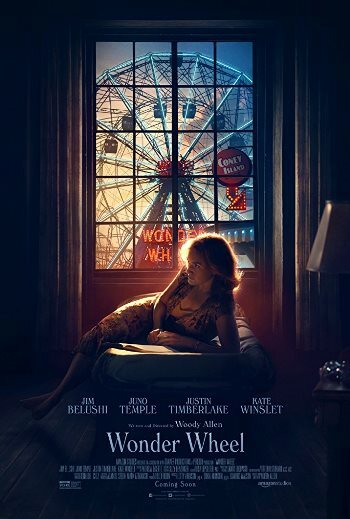 Instead Wonder Wheel comes off more like a low-rent version of Tennessee Williams’ A Streetcar Named Desire. There is no shame in a movie feeling a bit like Streetcar, that is every bit as great a play as any of O’Neill’s classics. So, I have no problem in theory if two of the main characters feel a bit too much like Stanley Kowalski and Blanche DuBois. I just wish Allen did a better job of living up to the apparent source material. Not that Wonder Wheel is a bad film. It’s just not as good as it should – and could – be. The Stanley and Blanche here are Humpty (Jim Belushi), a brutish barely on-the-wagon carny who runs the Ferris wheel, and his younger second wife Ginny (Kate Winslet), a harried waitress who is starting to question her choices as she hits 40. Beyond her unhappy marriage, she is also worried about her 10-year-old son Richie (Jack Gore), who seems to be a budding pyromaniac. This is a weird plot point to say the least. Richie’s constantly starting fires does not really advance the plot, nor does it lead to any real payoff, it simply is an oddball quirk to the story. While in Coney Island, she meets up with Mickey (Justin Timberlake) an adorable modern renaissance man who lives in Greenwich Village, writes plays, and then drives up to Coney Island to work days as a lifeguard. (Even in the 50s, I’m relatively sure struggling playwright/lifeguards could not afford to keep a car in the city.) There is an instant spark between Carolina and Mickey. The only problem is, he was having an affair with Ginny, and she is not willing to let go. It’s always amusing how lead actors in Allen’s films, no matter how different they are from the director, often seem to fall into imitations of the man. Justin Timberlake may make the most unconvincing pseudo-Allen yet – even worse than Kenneth Branagh in Celebrity – giving his performance a bit of a cartoonish feel. The story may not quite work, but Wonder Wheel looks stunning. Coney Island of the 1950s come alive with evocative settings, wonderful period artwork and modest bathing attire. Also, Humpty and Ginny’s apartment is amazing. It’s supposed to be a hard, depressing place to live, but to be honest, their home is spectacular, a huge wooden dwelling with three bedrooms, a floor to ceiling windows and a wonderful view of the midway. For decades now, since his peak creative period in the 70s and 80s, Woody Allen’s career has been an odd mix. He studiously releases a movie annually, but maybe one in every four or five are truly brilliant. Then he will have one in that group that is a total clunker. The rest are generally pleasant, but feel tossed off, a decent piece of filmmaking, but not nearly worthy of his finest work. Wonder Wheel belongs in that camp. It is very inessential Woody, but it has enough good moments going for it to check out until he comes out with his next Match Point, Blue Jasmine, or Crimes and Misdemeanors. Copyright ©2017 PopEntertainment.com. All rights reserved. Posted: December 8, 2017. Tags: 1950s, A Streetcar Named Desire, Blanche DuBois, Bobby Slayton, Brittini Schreiber, Coney Island, David Krumholtz, Debi Mazar, Eugene O'Neill, Geneva Carr, Gregory Dann, Jack Gore, Jim Belushi, John Doumanian, juno temple, justin timberlake, Kate Winslet, Maddie Corman, Max Casella, Michael Zegarski, movie review, PopEntertainment.com, Robert C. Kirk, Stanley Kowalski, Steve Schirripa, Tennessee Williams, Thomas Guiry, Tommy Nohilly, Tony Sirico, Wonder Wheel, Woody Allen. Bookmark the permalink.